3. Email on your Smartphone: find instructions here. Contact Tim Mitchell with any questions about your law school email account. 3. Updating your computer. Students are responsible for the ongoing maintenance of their operating systems, antivirus software (available through PioneerWeb under the resources tab), applications, and data. You can download Microsoft Office for Windows or Microsoft Office for Mac. The license is good for the duration of your coursework at Sturm College of Law. To download this software, log in to your email as described above, click on the gear in the upper right of the screen and follow these instructions. NOTE: You must be on campus to connect your computer to the law school wireless. You will be prompted for your username and passcode. Enter your DU law school email address as the username (jdoe-gt@law.du.edu ) and your law school email password for the password. That’s it! 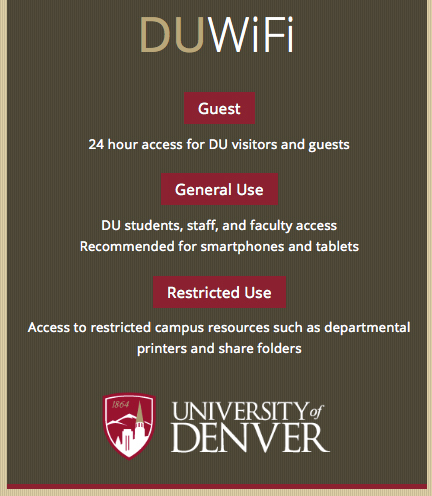 You are now connected to the DU WiFi network and will not be asked to reauthenticate for a year. You can set up printers by going to http://dunet.du.edu. Printers at the law school are located in the library. Contact Jessica Hogan with any questions about accessing Canvas.